I've worked on Morton Siding quite a bit recently. For those not in the know, Morton Siding is an industrial area between Malone and Malone Junction. During the 1950's, Rutland crews operated a yard switcher known as the "Malone Shifter" which did the switching at the Malone Yard, and all of the trackage in Morton Siding. Morton Siding is a diverse area, with six businesses operating in the 1950's, and a team track. During the St. Lawrence Seaway project, Malone Gravel loaded 750-series 2-bay hoppers for gravel that was shipped to Ogdensburg. Baker's Gas was at an all-time high in traffic volume. As you can see here, Morton Siding exists in front of the Norwood staging yard, with a six inch high backdrop between the two areas. 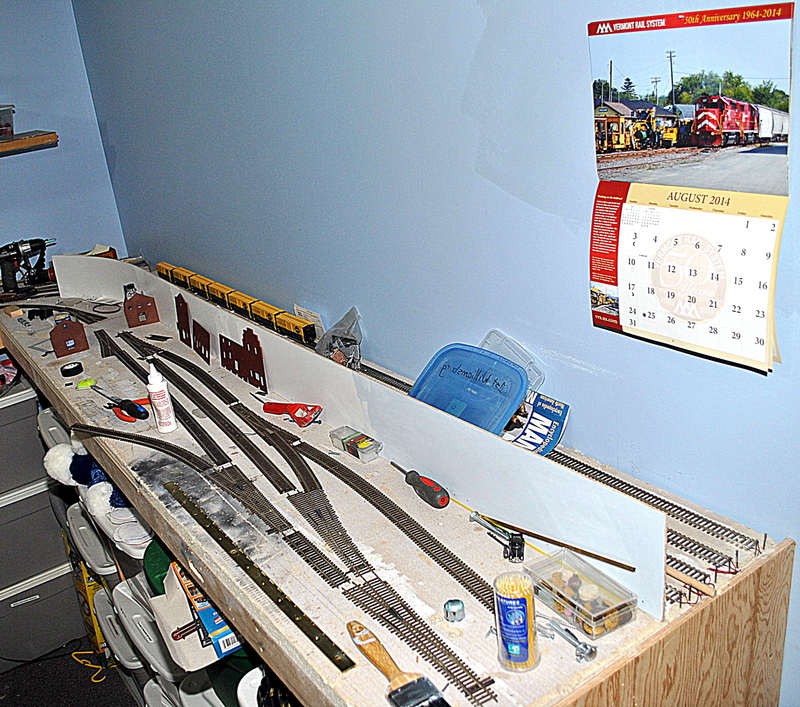 With exception to an unused two-car creamery track that should be located where the white glue bottle is, the track arrangement is exact to the diagrams from the mid-1950's. Close enough for me. The spur to the left that is hanging out over the edge, is Baker Gas. A small build-out will be located there into the aisle.